The first suburban branch of Adelaide Exchange was established in 1987 at the historic tourist site of Glenelg, near the famous beach strip visited by thousands of tourists from all over the world every year; on the main shopping boulevard. 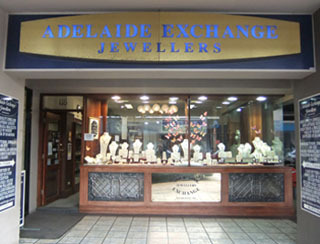 The Adelaide Exchange Jewellers Glenelg store is open 363 days a year for your convenience. At Glenelg, you will find Adelaide's most comprehensive range of coins and banknotes all in the one store; from the 18th century through to the latest releases from the Royal Australian Mint. Our on-site numismatist is available to assist you in selecting the best coins for your portfolio, or answer your numismatic questions. Our Glenelg store is a popular one for anyone looking for a special piece – we have a huge range of engagement rings, diamond rings, precious gem rings, earrings, brooches, chains, bangles & bracelets in yellow, rose and white gold variations. Opal jewellry is also one of our specialties. We also have an excellent range of wedding rings and dress rings for men and women. We also boast an on-site manufacturing jeweller who can provide you with a personalised consultation service for jewellery repairs, re-sizes, remakes or remodels. We are a premium jewellery store, gold bullion trader and numismatists. We also pay cash for your unwanted gold or precious metal items. No appointment is necessary and our friendly staff can help you with discretion, in each of our stores.